Over the weekend, I was unfortunate enough to come across an article by Jaclyn Harwell at “Modern Alternative Health” called “5 Reasons That Measles is Better Than Autism.” Unsurprisingly, it was full of misinformation and shoddy arguments. Indeed, it was so full of counterfactual claims and dishonest distortions of reality that I felt compelled to write a rebuttal, especially since the faulty arguments contained in the post are prevalent among antivaccers. Therefore, I am going to dissect that post and explain why it is nonsense. Before I get to Jaclyn’s “5 reasons,” however, I need to deal with several serious problems in the opening statements of the article. First, this post is fundamentally flawed because the entire thing is based on the false dichotomy that you have to choose between because vaccines and autism. In reality, of course, vaccines do not cause autism. As I explained at length in this post, numerous enormous studies have tested the vaccine/autism hypothesis and failed to find any evidence of vaccines causing autism. The only studies that suggested that vaccines cause autism were tiny and riddled with problems. Anecdotes don’t matter, deceptive documentaries are irrelevant, and the “CDC whistle-blower” did not present any actual evidence of vaccines causing autism (or of CDC corruption, for that matter). Only scientific evidence matters, and science is overwhelmingly on the side of vaccines. Second, the core argument throughout the article is that measles is a mild illness, but that argument is a blatant lie. I’ll deal with this at length under reason #5, but briefly, in developed countries with access to modern medicine, measles still has a death rate of 1 in 1,000 infected individuals. Nevertheless, it is true that in terms of sheer numbers, there are few measles deaths in industrialized countries today, but that is only because of vaccines! Indeed, in the US, in the 10 years prior to the introduction of the measles vaccine, measles killed an average of 440.3 children each year in the US alone (details and sources here; also note that the death rate per infected individual was roughly 1 in 1,000 then as well). Further, when we look at the entire world, measles still kills well over 100,000 people annually, and the World Health Organization describes it as, “one of the leading causes of death among young children” (WHO 2016). That’s not fear-mongering, that’s a fact. So while anti-vaccers want you to think that measles is trivial, actual epidemiologists have a very different view of this disease. Further, even when children don’t die from measles, there is still a 1 in 10 chance that they will develop an ear infection (which can cause permanent hearing loss), a 1 in 20 chance that they will develop pneumonia, and a 1 in 1,000 chance that they will develop encephalitis (a swelling of the brain; CDC 2015a). There are also other complications such as febrile seizures in 0.1–2.3% of patients (Orenstein et al. 2004). Indeed, during a large outbreak in France, nearly 25% of victims had to be hospitalized (Antona et al. 2013), and in the US from 2001–2008, 40% of measles patients were hospitalized (CDC 2011). You simply cannot describe a disease that hospitalizes 25–40% of its victims and kills over 100,000 people annually as a minor illness (WHO 2016). That is extremely dishonest (see reason #5 for a more thorough explanation of just how deadly this disease truly is). Third, the author claims that, “in the majority of outbreaks, most affected people have, indeed, been vaccinated.” This is an extremely common anti-vaccine argument, and it is horribly flawed. First, in the case of measles the claim itself isn’t even true. For example, in the 2001–2008 study that I mentioned earlier, 89% of patients were unvaccinated (CDC 2011). Similarly, during an enormous outbreak in France that involved over 20,000 people, 80% of patients were unvaccinated (Antona et al. 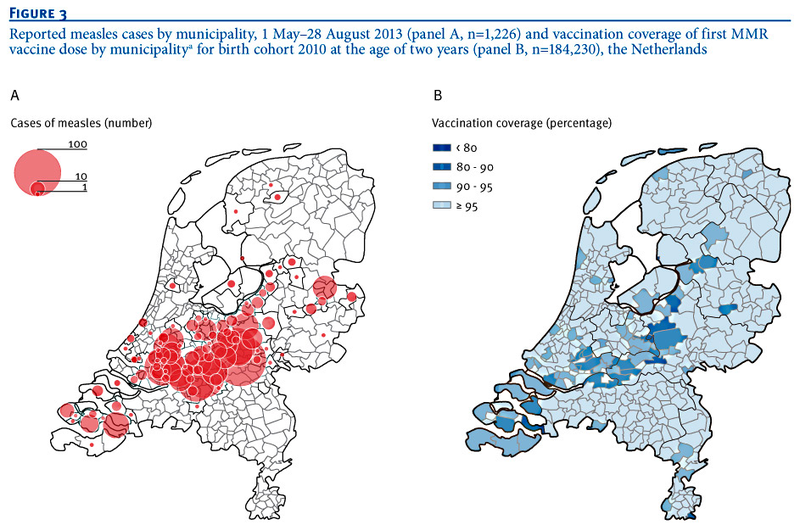 2013), and during a large outbreak in the Netherlands, 91.7% of patients were unvaccinated (Knol et al. 2013). Those are not cherry-picked examples. Rather they are the norm for measles outbreaks. Additionally, and far more importantly, this argument ignores rudimentary math. You have to look at the proportions not the raw numbers. Most people are vaccinated, so of course many outbreaks will affect vaccinated people. Simply looking at the raw number of cases doesn’t tell us whether or not vaccinated people actually get the disease more often, and when we look at the actual rates, we find that infection rates are substantially higher among the unvaccinated (King et al. 1991; Schmitz et al. 2011). To give a completely analogous example, most car accidents involve sober drivers, but that doesn’t mean that driving drunk isn’t dangerous. Most people drive sober. Therefore, in terms of raw numbers, most accidents involve sober drivers. However, when you look at the rates, you find that the rate of accidents is far higher among drunk drivers than among sober drivers. Finally, the author insinuates that “the efficacy of vaccinations is questionable at best.” Again, this is simply not true, especially for the measles vaccine. Even beyond the examples that I cited early of outbreaks corresponding to unvaccinated communities and higher measles rates among the unvaccinated, many other studies have examined the efficiency of the measles vaccine and it is quite high (93% with one dose and 95–97% with two doses; King et al. 1991; CDC 2015b). For example, Clemens et al. (1988), found that introducing the measles vaccine into a population reduced the measles death rates by 57%, but please go ahead and say that the vaccine isn’t effective or important (note the immense sarcasm). Now that we are clear on the actual facts, let’s look at the five arguments in the article. My intention is to address the original article point by point, but the original jumped around quite a bit and didn’t follow a great logical structure. As a result, I thought that it might be useful to provide a bullet list of key points and the sections in which they are discussed. Note: To be clear, if you want to say that surviving a measles infection without any serious or lasting consequences is better than a life-long affliction with severe autism, fine, I’m not going to disagree with you. What I take issue with is the dishonest and misleading claims about measles mortality rates, the dangerous and unmerited vilification of vaccines, and the damaging way that autism is presented. We need to stop talking about autism as if it is the world’s worst disease and as if people with autism are inferior, damaged, and in need of repair. That is an indignity that autistic people should not have to suffer. Autism is not the worst thing that could happen to your child. s actually proposing that you should avoid getting sick by getting sick. In contrast, a vaccine will prevent you from ever getting sick. In other words, a vaccine prevents you from ever getting measles, whereas measles only prevents you from getting measles a second time. Using a measles infection to protect you from a measles infection is like using pregnancy as a contraceptive. To be fair, some studies have found that vaccine-induced immunity does not last as long as natural immunity (Christenson and Bottiger 1994), but other research has found that both forms last equally well for many years (Jokinen et al. 2007), and since measles is predominantly a childhood disease, those first years are the really important ones. Additionally, the longevity of immunity can easily, safely, and effectively be extended with boosters, which, once again, prevent you from getting measles in the first place. Further, I have already provided multiple citations showing that the measles vaccine is very effective and infection rates are much higher among the unvaccinated. In other words, this anti-vaccine argument makes it sound like getting measles is the best way to avoid getting measles, but that is clearly ridiculous. The vaccine is by far the best way to avoid ever having to suffer through measles. Jaclyn goes on to reiterate that measles “isn’t a big deal” by citing the fact that between 1950 and 1960 the death rate for the US was less than 1 per 100,000 individuals (for the entire population, not per infected individual). As I showed earlier, however, that comes out to well over 400 deaths annually, which is in fact a big deal (also see #5 for an explanation of why the 1 in 100,000 figure is misleading). Even if vaccines caused autism (which again, they don’t), a life of autism is not worse than death by measles. She also claims that there were no deaths among the 1,153 US cases of measles from 2001–2013. First, that claim is not true. There were two measles deaths from 2001–2003 (CDC 2004), another two in 2009 (Kockanek 2011), and another two in 2010 (Murphy 2010). Nevertheless, the death rates are low, but this argument totally ignores the fact that the reason that we have so few deaths is because we have so few cases of measles, and the reason that we have so few cases is because we have vaccines! Vaccines are the only reason that we don’t have thousands of measles deaths each year. Indeed, it is estimated that between 1994 and 2013, the measles vaccine prevented >70 million cases of measles in the US, which comes out to a total of 57,300 deaths according to the calculations used by the authors (Whitney et al. 2014). That number may, however, be higher. If, for example, we simply apply the normally accepted 1 in 1000 death rate, then it would be 70,000 deaths (3,500 measles induced deaths annually). Either way, the point is that the vaccine prevents thousands of deaths each year, and you simply cannot pass that off as a minor thing. Finally, she quotes a “study” which said that, “The mass of scientific evidence compiled by researchers clearly indicates that the incidence of autism occurs following vaccination and is most closely associated with the schedule of vaccines culminating in the MMR vaccine” (Ewing 2009). However, that “study” was not actually a study. It wasn’t even a proper review. It was an entirely speculative opinion piece that made one false claim and unmerited assumption after another. It was based on a correlation fallacy, and it never once provided actual evidence to support the quoted statement. Further, it ignored the vast body of large studies that failed to find any evidence of vaccines causing autism. In other words, all that this paper did was propose a hypothesis, but that hypothesis has already been thoroughly tested and falsified. Indeed, even the first sentence of the paper is demonstrably false. It says, “that the occurrence of autism has risen steadily in the last decades is not in dispute.” In reality, the rise in autism rates is very much in dispute, with many studies concluding that it is at least largely due to a change in diagnostic criteria rather than an actual increase (Rutter 2005; Taylor 2006; Bishop et al. 2008; Baxter et al. 2015; Hansen et al. 2015). When I first looked at this paper, I was baffled by how a paper that opened with such a clearly false statement could possibly have passed peer-review. Then, I checked the journal it was published in, and it was a journal that that is so minor that it doesn’t even have an impact factor (in other words, the scientific community doesn’t take it very seriously). You should always be wary of journals like this. No it doesn’t. I explained this in detail here, but in short, after a measles infection, your body produces antibodies that are specific for measles. So it only “strengthens” your immune system in that you can’t get measles again. It doesn’t help you fight any other infections. Further, as I explained under #1, thanks to vaccines, you can get those exact same antibodies without actually getting measles. Further, recent research has shown that measles infections are so hard on your immune system that it actually takes up to 2–3 years for a child’s immune system to return to normal functional levels (Mina et al. 2015). In other words, measles infections weaken the immune system for several years, and these weakened immune systems lead to infections and deaths that aren’t generally attributed to measles. As a result, the actual measles death tolls are higher than we realize (not to mention that these additional infections often come with lasting side-effects). Finally, it is true that associations with some microorganisms help to prevent autoimmune disorders, but that is actually because those organisms “train” the immune system not to over-react. So they aren’t “strengthening” the immune system, they are training it give a reduced response (a “strengthened” or “boosted” immune system is actually what causes autoimmune disorders). Further, the microbes that do this are generally beneficial or benign, not pathogenic (Gaurner et al. 2006). So there is no evidence that a measles infection will help you out later down the road. I certainly don’t deny that autism can cause life long-problems (though I would like to stress that autism is a spectrum of disorders, and many people who are clinically diagnosed as autistic are very high functioning and live normal lives). However, in this section, Jaclyn reiterates her claims that measles isn’t dangerous, a measles infection gives life-long immunity to measles, etc. This section is really just a rehash of previous sections, so I won’t belabor the point. Next, she further tries to downplay the severity of measles by claiming that treatment with vitamin A reduces death rates by 62%. You’d think that the fact that she is talking about reducing death rates would make her rethink her claim that measles is “benign,” but apparently not. Nevertheless, there is some evidence that vitamin A is useful in overcoming a measles infection. However, citing that 62% figure without context is very deceptive, because it comes from a meta-analysis of studies in Africa where vitamin A deficiencies are major problems (Sudfeld et al. 2010). In industrialized counties, however, most of us have plenty of vitamin A, and vitamin A is a standard part of measles treatments (CDC 2016a). In other words, that 1 in 1,000 death rate that we talked about early already includes vitamin A treatments, but if you read Jaclyn’s post, it sounds like vitamin A is a way for you to improve those odds. Finally, she claims that autism can be cured, which is a dangerous way to give parents false hope. There is currently no cure for autism (after all, it’s largely genetic). There are ways to help manage it, but not cure it (please don’t flood the comments with anecdotes, because anecdotes are not valid scientific evidence. If you don’t have large, properly controlled clinical trials that were published in reputable journals, then you don’t have any evidence). Note: If you want to be pedantic, neither measles nor autism can be “cured” because your body, not a medication, is actually what fights the measles infection. So if we are going to succumb to pedantry, the core claim of this argument isn’t technically true. Much of this section is a regurgitation of previous arguments, so I will focus on the novel parts. The first of which is the claim that 1 in 45 children in the US have autism, coupled with the claim that 1% of the entire world’s population is autistic. I don’t have too much trouble with the 1 in 45 claim because it came from a legitimate study (though it is worth noting that the estimate that is currently accepted by health organizations is actually 1 in 68 children in the US; CDC 2016b), but the 1% figure is misleading. No source is given, but the source that I found lists it as 0.6%, not 1%, and when we are dealing with the world’s entire population, that rounding error is substantial (roughly 28 million people; Elsabbagh et al. 2012). Also, I have a serious problem with the way that those numbers are being used here. Jaclyn is clearly trying to use them to argue that autism is a very common thing, and, therefore, should be feared. However, autism is a spectrum of disorders, and early in the post, Jaclyn said that her post was “referring to children with severe, regressive cases of autism, not those that are high-functioning and more self-sufficient.” Do you see the problem? It is extremely dishonest to cite the overall autism rate if you are only talking about the most extreme versions of it. In other words, 0.6% of the world’s population has some form of autism, but only a small subset of that 0.6% has the type of severe autism that this post was supposedly about. So this is yet another instance of her using numbers dishonestly in a failed attempt to support her flawed position. Next, she makes the argument that most measles deaths are actually from developing countries that have poor sanitation standards. The claim itself is true, but the insinuation that sanitation standards are the cause of the infections is false. The deaths are from those countries because they are the ones that don’t have vaccines. As I explained here and here, the sanitation standards in the US were essentially the same in the 50s as they are now, yet they still had hundreds of measles deaths each year. Why? Because they didn’t have vaccines. Similarly, when we introduce vaccines into countries with very poor sanitation standards, the death rates drop (Clemens et al. 1988). Why? Because vaccines work (King et al. 1991; CDC 2015b). Further, as I explained earlier, industrialized countries continue to have large measles outbreaks when vaccination rates drop, and some of those outbreaks result in unnecessary deaths (Antona et al. 2013; Knol et al. 2013). She then goes on to act as if the 100,000+ annual deaths from measles aren’t really a big deal because they only represent a small portion of the total population. First, I find that attitude unconscionable, since those deaths are preventable. Second, vaccines are the only reason that the death rate is so low! Even if we back the clock up to the year 2000, the death toll was 546,800 (WHO. 2016). Why did it drop so rapidly between then and now? Because we have had a massive vaccination campaign and have taken vaccines to many developing countries, including ones that lack sanitation. Indeed, it is estimated that between 2000 and 2014, the measles vaccine prevented over 17.1 million deaths (WHO 2016). That’s 1.14 million per year. So you simply cannot present the current number of mortalities as evidence that we shouldn’t vaccinate, because the current numbers are low because of vaccines. Additionally, there is a huge problem here because the autism rates and measles death rates aren’t exactly comparable. For example, she claims that 1% of the world’s population has autism (that should be 0.6%), whereas only 0.002% of the world’s population dies from measles each year. Her argument seems to be that the odds of having autism are far greater than the odds of dying of measles, but that is not a fair comparison because measles deaths are not distributed evenly by age, and roughly 55% of deaths occur in children under 5 (Orenstein et al. 2004). So when you want to look at risk, you can’t simply divide the death rate by the world’s entire population (as she did) because children that die at a young age aren’t recruited into the older age groups. Thus, her calculations result in a gross underestimate of the mortality risk. Let’s get around that problem by looking at the risk that a child will die from measles before reaching five years of age, which is the time period during which 55% of measles mortalities occur (Orenstein et al. 2004). In other words, if you want to agree with Jaclyn’s argument, you have to argue that death by measles is better than a life with severe autism, because if everyone stops vaccinating, then the risk of a child dying from measles will be roughly equal to the current risk of a child developing severe autism. So that (according to Jaclyn) is what you are choosing between: death or life with a disability. In reality, of course, you don’t have to choose because vaccines don’t cause autism. So your children can enjoy an exceptionally low risk of death by measles without it affecting their risk of developing autism. *Note: I calculated the risk by taking the number of annual measles deaths (114,900; WHO 2016), multiplying by the proportion of mortalities that occur in children under five (0.55), dividing by the number of children on the planet (177 million), then multiplying by 100 to convert it into a percentage. The calculation for the death rate without vaccines was identical but it used 1.17 million deaths instead of 114,900. **Note: the risk of death is actually much higher than I described here because I left out another really important factor. Namely, the autism risk is estimated per child (you only “get” autism once), but the measles deaths are per child per year, so there are four opportunities for death. 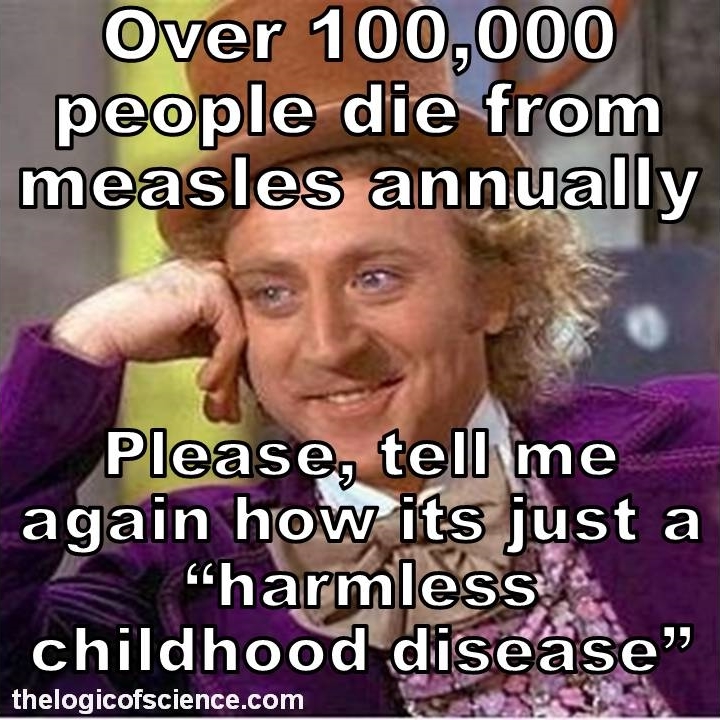 I left this out of the calculations because the math is convoluted since most children only get measles once. As a result, the probabilities change each year, and the math was more intense than I felt like explaining here, but I thought it was worth at least mentioning that my estimate is actually a gross underestimate. (I’ve found that few people bother to read math-heavy posts, which is quite unfortunate). ***Note: I was too lazy to calculate the overall mortality risk, but if anyone feels like doing it, it is a cumulative probability. So you calculate the probability for each age class, then sum those. You have to do it this way because anyone who dies of measles in one age class is automatically eliminated from all subsequent age classes. In other words, if you try to do the math using a large age range (say 1–20) you won’t get reliable results, because the mortality risk for a 20 year-old is vastly different from the risk for a 1 year-old and, as a result, many 1 year-olds die and never make it to 20. The best way to think about this is that for each age bracket, you are calculating the mortality risk given that you survived to enter that age bracket. Thus, the mortality risk for children under five is quite high, but if you survive to age five, then the mortality risk before reaching age eight is much lower, and the overall mortality risk for a 0–7 year old is the sum of the risk from ages 0–4 and the risk from ages 5–7. In short, measles is in fact a very serious disease. It currently kills over well over 100,000 people annually, and it is estimated that without vaccines that number would be over one million. Further, you have to remember that the majority of measles deaths occur in children under five years old, so without vaccines, we would expect a minimum of 0.35 deaths per every 100 children age 1–4. That is not something that should be taken lightly or described as “benign.” Additionally, this entire post is based on a false dichotomy, because vaccines don’t cause autism. So you don’t have to choose between the risk of a measles death and the risk of autism, because getting vaccinated does not increase your chance of developing autism. In short, this post made one unscientific, misleading, and downright dishonest claim after another. The measles vaccine is extremely safe and effective, and you should not give in to the baseless fear-mongering. Antona et al. 2013. Measles elimination efforts and the 2008-2011 outbreak in France. Emerging Infections Diseases 19. Baxter et al. 2015. The epidemiology and global burden of autism spectrum disorders. Psychological Medicine 45:601–613. Bishop et al. 2008. Autism and diagnostic substitution: evidence from a study of adults with a history of developmental language disorder. Dev Med Child Neurol 50: 341–345. CDC 2004. Epidemiology of Measles—United States, 2001–2003. Morbidity and Mortality Weekly Report 53:713–716. CDC. 2011. Measles — United States, January–May 20, 2011. Morbidity and Mortality Weekly Report 60:666–668. CDC. 2015a. Measles (Rubeola): Complications of Measles. Accessed 20-Aug-16. CDC. 2015b. Vaccines & Immunizations: Measles–Q&A about Disease & Vaccine. Accessed 20-Aug-16. CDC. 2016a. Measles (Rubeola): For Healthcare Professionals. Accessed 21-Aug-16. CDC. 2016b. Autism Spectrum Disorder (ASD): Data & Statistics. Accessed 21-Aug-16. Christenson and Bottiger. 1994. Long-term follow-up study of rubella antibodies in naturally immune and vaccinated young adults. Vaccine 12:41–45. Clemens et al. 1988. Measles vaccination and childhood mortality in rural Bangladesh. American Journal of Epidemiology 128:1330–1339. Elsabbagh et al. 2012. Global prevalence of autism and other pervasive developmental disorders. Autism Research 5:160–179. Ewing. 2009. What is regressive autism and why does it occur? Is it the consequence of multi-systemic dysfunction affecting the elimination of heavy metals and the ability to regulate neural temperature? North American Journal of Medical Sciences 1:28–47. Gaurner et al. 2006. Mechanisms of disease: The hygiene hypothesis revisited. Nature Clinical Practice Gastroenterology and Hepatology 3:275–284. Jokinen et al. 2007. Cellular immunity to mumps virus in young adults 21 years after measles-mumps-rubella vaccination. Journal of Infectious Diseases 196:861–867. King et al. 1991. Clinical efficacy of measles vaccine during the 1990 measles epidemic. Paediatric Infectious Disease Journal 10:883–888. Knol et al. 2013. Large ongoing measles outbreak in a religious community in the Netherlands since May 2013. Eurosurveillance 18. Kockanek. 2011. Deaths: Preliminary Data for 2009. National Vital Statistics Reports 56. Mina et al. 2015. Long-term measles-induced immunomodulation increases overall childhood infectious disease mortality. 6235:694–699. Murphy et al. 2010. Deaths: Final data for 2010. National Vital Statistics Reports 61. Rutter. 2005. Incidence of autism spectrum disorders: changes over time and their meaning. Acta Paediatr 94:2–15. Orenstein et al. 2004. The clinical significance of measles: a review. Journal of Infectious Diseases 189:S4–S16. Schmitz et al. 2011. Vaccination status and health in children and adolescents findings of the German health interview and examination survey for children and adolescents (KiGGS). Dtsch Arztebl Int 108:99–104. Sudfeld et al. 2010. Effectiveness of measles vaccination and vitamin A treatment. International Journal of Epidemiology 39:i48-i55. Taylor et al. 2014. Vaccines are not associated with autism: and evidence-based meta-analysis of case-control and cohort studies. Elsevier 32:3623-3629. Whitney et al. 2014. Benefits from immunization during the vaccines for children program era — United States, 1994–2013. Morbidity and Mortality Weekly Report 63:352–355. WHO. 2016. Measles. Accessed 20-Aug-16. This entry was posted in Vaccines/Alternative Medicine and tagged anti vaccine arguments, autism, Bad arguments, correlation fallacies, disease rates. Bookmark the permalink. The CDC says that there were likely millions of cases of measles every year, so how does an average of 440 (ish) deaths a year translate to a death rate of roughly 1 in 1,000 cases? The 1 in 1000 estimate is based on the reported number of cases, since we don’t actually know how many unreported cases there were. That may have been an overestimate resulting from poor reporting, but that number has held pretty consistently true in well-reported modern outbreaks in various developed countries (there are obviously slightly fluctuations though). But since we know that there were many many more cases than what was just reported, is it fair to say the death rate from measles pre-vaccine was much lower than 1 in 1,000? I think that looking at measles death rates pre-vaccine is important, but there are so many factors that could skew that – under reporting both measles cases and deaths, specifically. Looking at more recent outbreaks (with better records presumably) supports the 1 in 1,000 rate. Like the early 90’s outbreak in the U.S., with about 55,000 reported cases and 120+ deaths (plus later deaths due to SSPE). Even if the true number of cases was double the reported number, that’s still about 1 in 1,000. I can’t recall the stats from the recent outbreak in France, but I was thinking they were a bit lower (maybe 1 in 2,000? ), but still significant – especially since the outbreak was recent enough that SSPE cases haven’t surfaced yet. I wonder if we have any way or indication on how many measles deaths were not recorded as due to measles in that time. But the author of this article says otherwise! Why? Why is the author of this article contradicting the pharmaceutical companies? And why the readers of this blog do not confirm and verify directly the sources in order for not being deceived? You can check for yourselfs that vaccines cause autism! You are using the strawman fallacy, misrepresenting my argument to make it easier to attack. The arguments presented in my previous comment were not about the comparison between side effects and adverse events. It was about facts presented in the package insert of a DTaP vaccine, in this example, the Tripedia vaccine but any other vaccine shows us the some or even worse, where it clearly stats that a relationship exist between neurological diseases and vaccines, including autism. And many independent scientific studies already confirm the causal relationship between neurological diseases and vaccines! For people who believe in the cult of vaccines, it is a coincidence without causal relationship that children after taking vaccines contract blood and lymphatic system disorders, immune system disorders and neurological system disorders like cochlear lesion, brachial plexus neuropathies, paralysis of the radial nerve, paralysis of the recurrent nerve, accommodation paresis and EEG disturbances with encephalopathy (with or without permanent intellectual or motor function impairment), SIDS and Autism! Its not a strawman… you actually can’t tell the difference between a side effect and an adverse event. If adverse events are irrelevant, why is they are mentioned them on the Package Insert? You are playing with words and fallacies with me! By your understanding, if adverse events are not related to side effects, it is very coincidence that people after being vaccinated get a lot of adverse events like serious neurological disorders and diseases as well as many other disorders and diseases of the different biological human systems! In the “Adverse Events” section of a vaccine insert, manufacturers are required to report *any and all* outcomes within the study populations – which is why, for example, you will see automobile accident deaths included in some package inserts. Temporal relationship, not causal. And, finally, I’m pretty sure that Tripedia vaccine is no longer in use – plus it doesn’t really have anything to do with this article discussing the MMR, not Tripedia (DTaP). And why is that they do not have the ability to ““establish a causal relationship to components of the vaccine.”? They have no means to verify the causal relationship to components? Or the truth is that they don’t want people to know that components like tetanus toxoid, formaldehyde, aluminium, polysorbate 80, neomycin, bovin serum, Phenoxyethanol, and many other components of those vaccines known to be a human carcinogen, neurotoxic, nephrotoxic, ototoxic and genotoxic included in all DTaP and many other vaccines like the HPV and the hexavalent vaccines? The vaccines are so effective and safe that the pharmaceutical companies who make them don’t even know the exact mechanism of protection and they don’t evaluate the vaccines for the potential to cause carcinogenicity or genotoxicity. And it’s not because they have no means to do so, it is simply because they know perfectly well that vaccines cause cancers, DNA mutations (which is the first step in the development of a cancer), neurological disorders and many other disorders/diseases in all the systems of the human body! Why do you keep spamming the comments section with the same links and screenshots? 1) The vaccine’s individual components are already individually tested, and the dosages in the vaccine is greatly below the threshold for carcinogenic or genotoxic potential. 2) For some components, there is no plausible biological mechanism for the component to be carcinogenic or genotoxic. I’m not spamming! They are not the same links and they are not the same screenshots! Therefore, if someone receive a vaccine and contract a disease and have side effect reactions and report it, it is not valid as a causally linked to that particular vaccine? Are you trying to assairt that all of those adverse events reported and published on all of the package inserts of the vaccines, are false? We are supposed to believe in the Vaccine Safety Datalink without questioning? Is the Vaccine Safety Datalink and the medical class a religious sect? You are using the fallacy of composition/division because when you write: ”The vaccine’s individual components are already individually tested,.” you are assuming that one part of something has to be applied to all. Something we can not do because it is a scientifically dishonest and unprofessional and unethical practice! One thing is an individual component, another completly different thing is a combination of different carcinogenic, mutagenic and genotoxic components in a single conjugated vaccine! That’s why they don’t want to evaluate them! Because they know perfectly well that vaccines cause cancers, DNA mutations (which is the first step in the development of a cancer), neurological disorders and many other disorders/diseases in all the systems of the human body! It’s pretty clear that you don’t understand what an “adverse event” is. Temporal association is *not* a causal association. Note the use of “temporally” in your screenshot. What researchers do with the VSD and other databases is compare either rates of adverse events between groups (a group that has received the the vaccine, a control group that has not) in cohort studies, or, for more rare adverse events, they compare the exposures of cases (those who experienced the event or disorder) and controls (those who did not) in case-control studies. It’s not that people are necessarily lying when reporting adverse events; it’s that a single report of an event – or a group of reports even – has no value unless it is compared to rates within a population. For example, if 1 in 1,000 children develop a seizure disorder in the first year of life, regardless of vaccination, then a researcher can expect that, in a clinical trial of 10,000 babies, about 10 will report seizure disorders as an adverse event. A trial may only end up with 5 babies who have seizure disorders (fewer than the expected 10, so the evidence indicates that the vaccine is not increasing the risk of a seizure disorder), but manufacturers are still required to report seizure disorders as an adverse event because the seizure disorder was identified in the same timeframe as the clinical trial (“temporally”). Even if a person were vaccinated in front of you and die immediately after vaccination, you would never accept the relationship with the vaccine! That is why it is not worth discussing with the fanatics of the vaccination sect you are worse or the same than any religious sect, the only difference is that instead of idolize a god that cannot be questioned, you idolize science in the same way the religious fanatics idolize an invisible god that cannot be questioned! Only when one of your family, especially your son or yourself suffer the consequences of vaccination, it’s when you will start to open your eyes and face reality, until then it is useless to discuss with you because you will always find ways to not admit evidences presented and the contradictory of your belief system, just like any religious cult! What you are telling is that if someone dies or get sick from being vaccinated, it has no value, because by your understanding, Humans are numbers only to be compared to rates within a population! That is the most inhuman and medically dishonest and unethical behaviour to face life and mankind. No, what I am saying is that, if someone experiences an illness or is diagnosed with a disorder after vaccination, we need to examine *evidence* to determine if the illness/disorder is related to vaccination. It is a logical fallacy (can’t remember the exact name) to assume that *any and every event* that follows vaccination is caused by vaccination. That is exactly what the IOM does (it has a different name now, but same agency) in looking at epidemiological and biological/clinical evidence in its vaccine safety reports. These reports are the basis for the “Table Injuries” that are part of the vaccine injury compensation program here in the U.S. I don’t think you will find any person who will say that vaccines *never* cause injury or death. But conclusions about those injuries and deaths needs to be based on scientific evidence, and a list of adverse events in a package insert is not evidence. False cause. But I’m not using a false cause fallacy because all the evidences that I present to you are not a matter of false conclusions and false cause because they are related with vaccination as already been confirmed by several scientific studies and the pharmaceuticals themselfs on the package inserts that obviously they admit it in a subtle way to maintain the doubt and to not be held responsible if any disorder or disease occurs after vaccination and confirmed as a causal relationship with vaccines. So many times, I hear about “if it happened to you you’d change your opinion” and I still haven’t. Yes, I’m a step parent in the situation so not technically my child, but a full time caregiver to a child with moderate autism. So let’s just quick go down the list of children here and see why I haven’t changed my mind. Both families in the same area and all within the same ages, same timeframes, even some of the same schools and doctors (small town). Why did the unvaccinated children still present with autism if it is vaccines that cause it? Why does her whole side of the family present with autism if it’s not genetic and some were not vaccinated? Why does husband’s side have no autism yet were all vaccinated with, most likely, the same vaccines as the the children that did present with autism? autism is being used as a central point in the entire debate of vaccination, as a distraction focus, to prevent the investigation and discussion of all other disorders and diseases not only neurological, caused by vaccines! I’m writing about vaccines, this article is about vaccines, so my comments have everything to do with this article since we are discussing about vaccines! And if this article is discussing the MMR, MMR is about vaccines! And why is that the author stats that “In reality, of course, vaccines do not cause autism.”, using the fallacy texas sharpshooter where he cunningly cherry-picked a data cluster to suit his argument saying that the studies that suggested that vaccines cause autism were tiny and riddled with problems, and found a pattern (the studies) to fit the presumption that vaccines do not cause autism. He is also using the fallacy of appeal to authority trying to convince his readers that because there are “numerous enormous studies”, it must therefore be true. And the composition/division fallacy because when he says:”In reality, of course, vaccines do not cause autism.” he is assuming that one part of something has to be applied to all or that the whole must apply to its parts. It’s not cherry-picking when someone is using the highest levels of scientific evidence to support their conclusions, like the Taylor et al. (2014) meta-analysis of 10 studies involving over 1.2 million children. How can you assert that the Package Insert of the vaccines are “pretty irrelevant”? We are talking about farmaceutical official documents! Not wishful thinking conspiracies! and you know why these documents clearly states that there is a causal relationship between vaccines and a lot of neurological disorders, diseases, and another system disorders? Because when the disorders and diseases appear in people vaccinated, they can not be held responsible because they reported the possible risks on the packe insert, therefore they clean hands and push responsibilities for doctors and nurses, parents and all other people who are vaccinated! Systematic reviews and meta-analyses are the highest level of evidence because they take into account the results of *many* studies, as do the reports completed by the IOM. No appeal to authority there. If you would like to discuss a specific study re: autism and vaccines that you think is better quality or more comprehensive than the ones provided in the article, then please provide a link. The sections of the insert that you copy-and-pasted are irrelevant because the MMR isn’t given to babies under one or pregnant women – so why would the manufacturer test the vaccine on these populations? I’m not discussing studies, I’m confront all of you with facts presented on the package insert of all of the vaccines that you cunningly ignore! Vaccines cause neurological disorders and a lot of other system disorders and diseases! You refuse to accept what the pharmaceutical companies accept in order to not be held responsibile for the potential outcome of dirsorders and diseases! The sections of the package insert that I’m sharing here is not irrelevant for the subject that I’m discussing: Vaccines cause neurological disorders, like autism! I’m not discussing the age of the children that can receive those vaccines, I’m discussing whether or not those vaccines can cause neurological diseases and dirsorders, which they can and cause! So, you don’t want to look at any scientific studies, just package inserts (which are legal, not scientific, documents) AND you don’t want to even critically analyze what information is being presented in the inserts in context, just highlight and underline the bits and pieces that support your belief that vaccines cause neurological disorders. Okay then. Nothing more I can contribute that would make you see things differently, I guess. But I hope that you can appreciate the deep irony in accusing others of cherry-picking and basing their conclusions on belief rather than evidence when you are a shining example of both of those behaviors. Package inserts are not just legal documents because they do not contain only legal issues, they also contain scientific materials like the constituents of vaccines, their effects, results of the clinical studies, etc. and these are not legal issues but scientific! You do not want to admit scientific facts demonstrated in clinical trials, such as: “Sudden Infant Death Syndrome (SIDS) has occurred in infants following administration of whole-cell pertussis DTP and DTaP. or scientific studies like these:Sudden infant death syndrome (SIDS) shortly after hexavalent vaccination: another pathology in suspected SIDS? or even these:Infant mortality rates regressed against number of vaccine doses routinely given: Is there a biochemical or synergistic toxicity? or these: Sudden infant death following hexavalent vaccination: a neuropathologic study. The bits and pieces presented here where we can clearly conclude that vaccines can and cause neurological disorders and a lot of different disorders on the various human body sysyems, are not a matter of belief! They are facts that you cunningly and constantly choose to ignore! Please read the VAERS overview to get an idea of how adverse events are reported and what it means. The VAERS reports are what pharmaceutical companies are listing in their inserts. You will never accept that vaccines are responsible for various disorders and diseases because by your logic the cause of those disorders and diseases are not the carcinogenicity and mutagenic aspects of the vaccines, knowing perfectly well that even the farmaceutical corporations does not evaluate their vaccines for the potential of carcinogenic and mutagenic or impairment of fertility because they perfectly well that vaccines can and cause cancers and mutations! But you will always find an excuse to justify the unjustifiable! How is asking you to read the VAERS an excuse? – You said the manufacturer is stating that their products cause autism based on their inserts. – Others pointed out that that statement was incorrect because they have to list adverse events and adverse events aren’t proof. – You repeated that the adverse events listing in inserts are admission that the manufacturers have proof and know their products cause autism. – I posted the VAERS as reference to the fact that you are misinformed. The VAERS, which is what those listings are based on says it’s not proof. Explain how I used the VAERS as an excuse? I’m just pointing out facts and an error in your argument. – a reason or explanation put forward to defend or justify a fault or offense. – a poor or inadequate example of. – attempt to lessen the blame attaching to (a fault or offense); seek to defend or justify. – release (someone) from a duty or requirement. I will completely accept that vaccines responsible for disorders and diseases when you list out each disorder/disease and show studies that prove vaccines cause it. You tried that by pointing to the insert. I have shown you that the part you pointed to is not proof. That’s not opinion/fanaticism/excuse/etc. It’s simply stating facts. You state that I know perfectly well that they don’t evaluate their vaccines for carcinogenic effects… Actually, I don’t know perfectly well about that. I haven’t looked into it yet as it hasn’t been a priority for me yet. This article was about autism and vaccines, something that I personally deal with on a daily basis, so have invested a lot of time learning about. I’ve addressed your points about autism from both a personal (my reason for not seeing the connection) and evidence based points (pointing out the VAERS). I would like to discuss this further with you, but must ask that we stay on topic and talk about the subject of this post – Autism and Vaccinations. It’s easier for all involved if we stay with one point and then move on to another after this one is exhausted. Now, do you have proof that vaccines cause autism? Great read! The original article needed this kind of rebuttal. Thank you for providing it. Small thing, in paragraph 5, I think you meant to say that 91.7% of patients in the Netherlands were unvaccinated, not vaccinated. We all know what you meant, but I don’t trust some people to refrain from quoting the typo as some kind of “proof”. This article is full of fallacies! If vaccines are safe and effective why is that they are not being evaluated for carcinogenic or mutagenic potential, or impairment of fertility? Thank you for this. I can’t believe people are still arguing against vaccines which is why posts like yours are important and should be widely circulated. I shall tweet the link too. Because we use our brains! If vaccines are safe and effective why is that they are not being evaluated for carcinogenic or mutagenic potential, or impairment of fertility? If vaccines are safe and effective why is that the pharmaceutical companies say otherwise? The points you’ve raised in your reply to me have already been answered above. Vaccines are neither safe nor effective, admitted by official farmaceutical documents themselves! Vaccines cause cancers, neurological and autoimmune diseases and are responsible for almost all diseases of the modern world! But he had drawn the right conclusion. This disease was close enough to small pox in order to make human body to build up defense against the both. He called his vaccination as ‘variolation’. Nevertheless, vaccination was discovered. It’s sad to notice, that there still are people, who with whatever reason or mean would like to draw this marvelous discovery into oblivion and discredit its significance. You didn’t told the whole story to the end. Let me finish: and so it was born the criminal and corrupt complex of military-medical-pharmaceutical industry, who became billionaires forever by selling vaccines, drugs and palliative care to all the other diseases that vaccines cause! The maids did not injected themselves with any vaccine! They just got the disease and therefore were immune! I love how you left off the part where they save millions of lives each year, because many children die from the diseases before they develop immunity. Wasn’t there another measles death in 2015, of a young woman in Washington state? Asking for a clarification of a statistic is not a fallacy, it’s not even an argument. You should really learn how logically fallacies work before you start accusing people of them. I know very well how logically fallacies work, my dear Fallacy Man! What!? All that the commenter did was ask a question. That’s it. They didn’t make an argument, they didn’t try to use fear, they just asked a question and provided pertinent details for the question. Your response is one of the craziest things I have read. There was a measles death in 2015, but I didn’t mention it because it was outside of the specific range of dates that the author cited. How the WHO came to that conclusion if in their own website we don’t have any sources or material studies to correctly analyse that statement they provide in just one paragraph? How can we believe in those numbers if we don’t even know how they get it? We are supposed to believe without question? The WHO is a religious sect? Even if those 100.000 numbers are true, analyzing the components of the vaccines, we can clearly conclude that to immunize children we have to kill other children, or prevent them from being born, because vaccines needs abortions, and even worse, it needs aborted white (caucasian) female fetus! About neomycin, it is a neurotoxic, carcinogenic and mutagenic component! It interferes with vitamin B-6 absorption, which is the cause of epilepsy, and mental retardation. All throughout your comments you are making the same mistakes over, and over again. So I will just address them here. First, as others have pointed out, the vaccines inserts themselves say that causation has not been established for many of the claims that you are making, yet you ignore that part of the package (I’m not sure how you don’t see the problem with only believing part of the insert). Second, you continue to ignore the fact that the dose makes the poison. Yes, vaccines contain chemicals that are dangerous in high doses, but the doses in vaccines are tiny and have been well studied. Pears contain formaldehyde, and formaldehyde is highly carcinogenic, but nobody fears pears. Why? Because the dose is low. It is the exact same thing with vaccines. Third, yes, vaccines have side effects. No one denies that. Indeed ALL medications (natural or otherwise) have side effects, because the chemical reactions in the body are exceedingly complex. So what is really important is the rates of those side effects, and those rates have to be compared to the benefits of the vaccine. Every decision has risks (including the decision not to vaccinate). So it is always about weighing the different risks, and when you do that for vaccines, you find that the risks are very low (serious side effects are exceptionally rare), and the benefits are enormous (see the citations in the post). Finally, and this is the really important one, you are blindly ignoring actual scientific studies. These are the sources that actually test the vaccines to determine how safe and effective they are, and you are blindly rejecting them. Take vaccines and autism, for example. If you actually read that post, you would realize that I carefully dissected not only the literature supporting vaccines, but also the papers that anti-vaccers cite opposing vaccines. You accuse me of cherry-picking and committing a sharp-shooter fallacy, but if you actually read that post you will see the exact opposite. I talked about lots of studies on both sides. Indeed, I went through every paper that I saw anti-vaccers citing as evidence of vaccines causing autism (that was well over 100 papers). Further, the quality of the papers is the most important thing, and, once again, if you read the post, you will see that vaccines are supported by numerous exceptionally large, high quality studies, whereas the anti-vaccine studies are small, used weak designs, and have numerous problems. That is not cherry-picking, that is rationally examining the evidence. In conclusion, I would like to ask you the same question that I asked you about GMOs. What would it take to convince you that you were wrong, that you were in fact misusing the package inserts, and that vaccines are actually very safe and effective? I’ll tell you what it would take to convince me that I was wrong, it is the same thing that was required for GMOs, and it is the same thing that is required for any topic: EVIDENCE. Show me the large, properly controlled studies that have found that vaccines are dangerous/ineffective, and I’ll change my mind. Again, to be clear, simply showing that an adverse event sometimes occurs is not enough. It has to be causally linked, and the rate of the event has to be high enough that it outweighs the benefits. Have you censured my comment? Or it went to your spam box because of the links provided? Seriously, enough of your conspiracy nonsense. You’re just making yourself look pathetic and unstable at this point. That’s normal. The more you research the crazy you sound to ignorant people. I have not censured anything (as should be obvious from the fact that I have tolerated you flooding my posts with utter nonsense), and there is nothing in my spam box. So if you tried to post something and it is not showing up, I don’t know why. Try posting again (if there are lots of links, perhaps try splitting them into several comments). “WI-38 is a diploid human cell culture line composed of fibroblasts derived from lung tissue of an aborted white (caucasian) female fetus”? Are you trying, again, to play with words with me? you seem to be ignoring the “derived from” portion of that quote. I didn’t ignore it because that portion does not invalidate the fact that vaccines require abortions! “requirED” past tense. The do not “require” (present tense) abortions. Further, those abortions were not done for vaccines. They were for other reasons and scientists simply used the fetal tissue after the abortions. Then, once the cell line was established, no additional abortions were necessary. So no fetuses were aborted for the purpose of making vaccines, and if no fetus was ever aborted ever again, it would not affect the production of vaccines. So your claim that “vaccines require abortions” is blatantly false. Additionally, this line of reasoning is completely and totally irrelevant to whether vaccines are safe and effective. Vaccines are responsible for neurological dirsorders and impairment of fertility which leads to abortions! First, that is a completely different argument than arguing that abortions are necessary for the production of vaccines. So you are shifting the goal posts here (which is not logically valid). Second, you seriously need to read the entire insert, rather than cherry picking. For example, in the screen shot you provided, read the last sentence of the first paragraph, “The proportions of adverse outcomes observed were consistent with pregnancy outcomes observed in the general population.” In other words, the rates among vaccinated women were the same as the rates among women who did not receive the vaccine! Therefore, the vaccine was not responsible. This is something that you are continuing to ignore over and over again: the fact that an adverse outcome followed vaccination does not mean that the vaccine was responsible (you are committing a post hoc ergo propter hoc fallacy). Ok, I will use both arguments because both are true! Vaccines make use of WI-38 which is a diploid human cell culture line composed of fibroblasts derived from lung tissue of an aborted white (caucasian) female fetus” Vaccines are also responsible for neurological dirsorders and impairment of fertility which leads to abortions! Vaccines are using abortions to create even more abortions! That’s normal, it is called Logic of Science, you inject something in a living organism which is dead (abortions) you will get something dead, abortions! Wow, you really can’t accept rudimentary facts can you. Please re-read the previous comments because they clearly explained that vaccines simply use a cell line that was established via an abortion that was performed for reasons other than vaccines. In other words, no fetuses were aborted for the purpose of making vaccines and vaccines do not require additional abortions. You are also completely ignoring the fact that the very insert you quoted states that pregnancy outcomes were the same for vaccinated and unvaccinated women. Having a rational conversation with you is clearly impossible, and I won’t waste any more time on it. You are using the Stawman Fallacy because you are misrepresenting my arguments in order to become much easier for you to present your own position as being reasonable, but this kind of dishonesty serves to undermine honest rational debate. I did not write that fetuses were aborted for the purpose of making vaccines, I wrote this: Vaccines make use of WI-38 which is a diploid human cell culture line composed of fibroblasts derived from lung tissue of an aborted white (caucasian) female fetus” Vaccines are also responsible for neurological dirsorders and impairment of fertility which leads to abortions! The two hexavalent vaccine studies cited are case reports investigating specific SIDS deaths. I could only access the abstracts, but from just reading the abstracts, it’s clear that there isn’t definitive evidence linking these SIDS deaths and the hexavalent vaccine within these articles. In fact, one of the abstracts specifically includes the statement that, “This study does not prove a causal relationship between the hexavalent vaccination and SIDS.” It’s in your screenshot! The authors do make certain recommendations for investigating SIDS deaths that are temporally associated with vaccination. Note also that the hexavalent vaccine is not given in the U.S. . . . so it doesn’t make sense to associate the hexavalent vaccine with infant deaths in the U.S. – which is what it seems like you are trying to do with lumping these studies together with the others. Baldo et al. (2014). Combined hexavalent diphtheria-tetanus-acellular pertussis-hepatitis B-inactivated poliovirus-Haemophilus influenzae type b vaccine. The hexavalent vaccines are at Phase III of clinical trails in the U.S., that is, they are killing babies in the United States and using tissues of aborted white (caucasian) female fetus in order to test the vaccines to be approved in the United States. And we all know very well that they will aprove it not matter how many babies died! As far as I know, the hexavalent vaccine does not use fetal cell strains in its development – I think that is only relevant for Hep A, rubella, and varicella within the realm of childhood vaccines. If, through the clinical trial, the hexavalent vaccine is determined to be as safe and as effective as the current combo (usually a pentavalent vaccine like Pentacel or Pediatrix plus a single vaccine), then great! That’s one less needle at the 2 and 6 month appointment (and perhaps either the 12 or 15 or 18 month appointment), reducing the total number of injections to two. Two injections for protection against seven diseases! Vaccines are neither safe nor effective! Children don’t need needles, all they need is nutritious food, hygiene, affection, contact with mother nature especially with the land, walk barefoot on the earth, care and attention, dancing, singing, painting, classical music, be in love, classical dances like the ballet that helps a lot the proper functioning of the homeostasis, and to have lots of fun! There are many flaws in the cited Miller and Goldman study about infant mortality rates regressed against number of vaccines: cherry-picking dataset, ecological fallacy, not accounting for other factors that affect infant mortality, making conclusions not supported by data, etc. There is a great critique on the study I’d like to link to – but, alas, the comment box does not like my links! It’s essentially a flawed study completed by two guys who have neither the education nor the experience to do a proper statistical analysis. Other research (a meta-analysis of 9 case-control studies, higher level of evidence than one flawed ecological study) indicates that well-baby visits and vaccinations reduce the risk of SIDS (Vennemann et al., 2007. Do immunisations reduce the risk for SIDS? A meta-analysis.). Additionally, as the number of vaccines has increased in the last 25 years, SIDS rates have decreased – which is the opposite of what one would expect if vaccines increased the risk of SIDS. Ecological fallacy? Where? You are using the fallacy fallacy, because you presumed that because a claim has been poorly argued, or a fallacy has been made, that the claim itself must be wrong. You are using the srawman fallacy, by exaggerating, misrepresenting, or just completely fabricating someone’s argument, it’s much easier to present your own position as being reasonable, but this kind of dishonesty serves to undermine honest rational debate. You are using the false cause fallacy! You presumed that a real or perceived relationship between things means that one is the cause of the other. Further, no fallacy fallacy was committed. She simply (and correctly) argued that the study was flawed. We know that the conclusions of the study are also flawed because of the other evidence (like the meta-analysis that she cited). In other words, she didn’t say, “the study is flawed, therefore their conclusion is flawed.” Rather, she said, “the study is flawed, and here is evidence that shows that the conclusion is also flawed” (paraphrasing). Similarly, she never exaggerated anyone’s claims. Again, she just pointed out that the study was flawed. You are, however, committing a strawman fallacy by claiming that she was making claims that she wasn’t actually making. Finally, her statement that vaccines have increased while SIDS has decreased is not a false cause because she did not say that they were causally related. Rather, she said that this relationship is the opposite of what you expect if vaccines cause SIDS, which is completely true (i.e., if vaccines cause SIDS, then as vaccines go up, SIDS should also go up, not down). Correlation doesn’t automatically demonstrate causation, but a lack of correlation does show a lack of causation. Thank you! That was the article I was trying to link. She is using the fallacy fallacy because she presumed that because a claim has been poorly argued, or a fallacy has been made, that the claim itself must be wrong. She is also using the appeal to authority because each time she comments she refuses to accept independent scientific studies and instead she always argument with studies from government agencies and organizations! And of course, the srawman fallacy because when she claims that: “It’s essentially a flawed study completed by two guys who have neither the education nor the experience to do a proper statistical analysis”, she is exaggerating, misrepresenting, or just completely fabricating someone’s argument, therefore it’s much easier for her to present their own position as being reasonable, but this kind of dishonesty serves to undermine honest rational debate. I would say that’s an ad hominem rather than a strawman – – but I wouldn’t bring up Miller and Goldman’s lack of education or experience except that it was pertinent in explaining *why* the study was so flawed. It takes a certain level of education to be able to put together an observational study that yields valuable information. Ultimately, it is the quality of the evidence that I am concerned about. And the Vennemann et al. 2007 meta-analysis was from the Institute of Legal Medicine, University of Münster; the first author has completed a lot of general SIDS research, not just vaccines. Unless you are proposing that all government agencies worldwide (including publicly-funded universities) are somehow colluding in some massive agenda . . . oh, maybe you are! You prefer to believe in Santa Claus as a one government agency that distribute presents to those children that behave nicely, and I choose to believe that every Human being has its own Santa Claus and Mother Christmas inside them not outside them! And do not need to obey orders from Santa Claus Government agencies that distribute gifts to children who behave well, that is, who obey without questioning the ruling body! I choose to believe in independent critial thought and actions that tells me that I don’t need ruling government bodies to tell me what to think, what to say, what to wright and what to feel! I choose to believe in everyone Santa and Mother Claus inside each of us that loves to give presents and knowledge not only to those children who obey nicely, but especially to those children who misbehave and think for themselfs in a creative and sensitivity way! That being said, I think you understand quite well what I’m trying to say to you in regarding to that “massive agenda”! Unfortunately, diseases like measles, diphtheria, Hib, etc. don’t really care whether you believe in Santa Claus, Mrs. Claus, the Easter Bunny, the Tooth Fairy, etc. Whe I was in grade school, there was a large measles outbreak here in the U.S. – and children died. Thousands ended up in the hospital. Many were preschoolers who had not been vaccinated yet because only one MMR dose was required before kindergarten (now two doses are standard before kindergarten). So, please, spare me commentary about how children don’t need vaccines when they have fresh air and art and dancing. I think I’m done responding. There is no outbreaks! The fallacious word outbreaks is being used to propagate fear in the world! Diseases like measles have always existed, and deaths are not caused directly by the disease because measles does not kill anyone, there are other circumstances that lead to the death of a child, as a lack of health care, sanitation, hygiene and malnutrition. In the same way you refuse to accept, even with scientific studies, that vaccines can and cause SIDS and many disorders and diseases, I can refuse to accept, with evidences, that measles does not have causal relations with deaths! outbreaks is a word that is being used to disseminate fear with the appeal to emotion fallacy! 1989-1991, there were 55,000+ cases of measles in the U.S. – that’s an outbreak. Children and adults died of measles encephalitis, measles pneumonia, and – years later – SSPE, when the measles virus that has remained in their brains for years starts destroying their ability to communicate and interact . . . and eventually breathe and function. There’s plenty of evidence that measles can kill, in developed countries with quality healthcare, nutritious food, and etc. The outbreak was created by vaccination programs, because 1989 and 1991 was a period of intense vaccination program schedules! That is why you didn’t mention in your argument that those 55.000+ cases of measles in the U.S. were from unvaccinated children and adults because you know perfectly well that those children and adults were in fact vaccinated! I will summarize in a single sentence all that I have shared here: What is causing children, youth and adults to get sick and what is killing them are the corrupt and criminals of the military-chemical-medical and pharmaceutical complex! The Torch study is from 1982, based on a vaccine that is no longer used in the U.S. (whole cell pertussis) – so how is that relevant to U.S. SIDS rates today? Also, I was reading through the Walker study cited by Miller and Goldman (1987 – still based on whole cell pertussis vaccine), and one interesting item that Miller and Goldman omit from their discussion of the Walker study is that, “The mortality rate of non-immunized infants was 6.5 times that of immunized infants of the same age (95 per cent CI, 2.2 to 19).” So there appeared to be an increased risk in the first 4 days after vaccination (though the HUGE confidence interval of 1.7 to 31 leaves me wondering about the data), but the overall risk for vaccinated babies was *still lower* than the risk of unvaccinated babies! Or you could try and explain why the rate of SIDS fell dramatically after the government’s back to sleep campaign if it was vaccines which are responsible for SIDS. CDC and WHO? I’m sorry but we are having a very serious discussion here. Are you kidding with me? No, but I think you may be. You are using the fallacy of “tu quoque”, You avoided having to engage with criticism by turning it back on the accuser – you answered criticism with criticism. You say you are having a serious discussion and then you come up with “are you kidding with me?”. Really!! You are using the “tu quoque” fallacy. You avoided having to engage with criticism by turning it back on the accuser – you answered criticism with criticism. Keep telling yourself that. Your arguments have been comprehensively answered above by others. My arguments were not answered comprehensively, they were answered fallaciously and deceptively. The first one is from 1986 (are you joking with me?) and it is a very poor article and not really a study because it was based on what other countries, like England, reported! It was clearly a biased report! The second one is from 1988, again are you joking with me? This reports that are not stuies were made 28 years ago long before several other studies have been carried out. The third one, a report from 1995 with 5 pages! You gave absolutely no specifics about what is wrong with these articles. You just said “they are biased and wrong.” That is not how arguments work. Additionally, why are studies that are old or from other countries invalid? Similarly, did you honestly suggest that a study should be rejected because it is short??? Clearly if the study is only five pages long it must be wrong! Never mind the fact that it was a large nation-wide cohort study. It only had five pages so clearly it is untrustworthy (note the immense sarcasm). All that your comment really did is demonstrate that you are arguing based on biases not facts. For example, for study one you said, “It was clearly a biased report!” Really? What makes you say that? Where is your evidence that it was biased? Why do you think it was biased other than that it reached a conclusion you don’t like? Similarly, you said, “I will not spend my money to read a biased PDF report” how can you possible know that these reports are biased if you haven’t even read them? Answer: you can’t. You are ASSUMING they are biased because they disagree with you. In other words, you have decided that these studies are wrong before you have even looked at them, which is why this conversation is totally pointless and I won’t be continuing it. If you are going to decide whether or not to accept a study before even reading it, then you obviously have no interest in actually considering evidence and it is clear that nothing will ever make you consider the possibility that you are wrong, so I won’t waste any more of my time trying. PS I find it utterly hilarious that you are now adamantly against anything produced by the German government when in our previous conversation you argued that GMOs are bad because Germany says they are bad (that’s what we call hypocrisy). This from a blog by a history teacher is spot on! I didn’t say the articles were wrong! You are puting words in my comments, misrepresenting my argument to make it easier to attack: Strawman Fallacy!